Motorists could face backups of up to four miles during work this year during $64 million project to upgrade 25 miles of expressway in Wayne County. Detroit — Motorists could face backups of up to four miles during work to upgrade 25 miles of Interstate 94 in Wayne County, the Michigan Department of Transportation said Tuesday, and headaches could start this weekend, when the freeway closes for a stretch in Detroit for bridge demolition. Construction work on the $64 million project means that I-94 be closed over the weekend between Conner Road and Interstate 75, transportation officials said. The closure will be in effect from 9 p.m. Friday to 5 a.m. Monday, weather permitting. Crews will demolish the French Road and Concord Avenue bridges over I-94. MDOT plans to repair or replace 67 bridges, make concrete repairs and perform other work in six segments between Conner Street in Detroit and Interstate 275 in western Wayne County. Work is expected to conclude in November. MDOT officials said they understand the reaction to orange barrels on I-94 for the road construction season and sympathize with motorists. "But this is getting it all over quicker as opposed to dragging it out," said Bill Erben, MDOT's manager for the project to repair I-94 between Michigan Avenue and I-275. "It makes some sense, to me, anyway, to tear the Band-Aid off all at once and get it done." Transportation officials announced the road work plan Tuesday at MDOT's Southeast Michigan Transportation Operations Center in downtown Detroit. 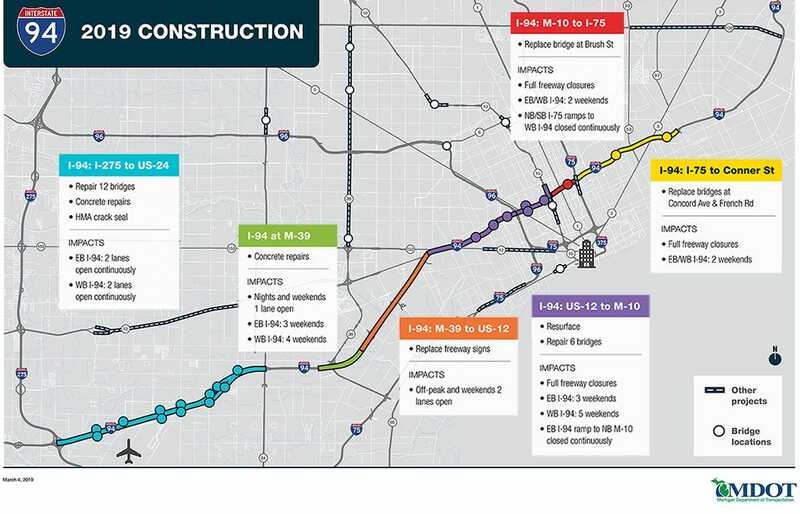 The project includes overhauls of 67 bridges as well as a seven-mile stretch of the freeway between Conner Avenue and I-96. Concrete near the Southfield Freeway and bridges between Telegraph and I-275 will undergo repairs. The freeway is more than 60 years-old and an estimated 150,000 motorists use it every day. Over the weekend, all of I-94's ramps between Conner and I-75 will be closed. Westbound traffic on the freeway will be detoured to westbound Eight Mile to southbound I-75 and back to westbound I-94. Eastbound traffic will be detoured north on I-75 to eastbound Eight Mile and back to eastbound I-94. The bridges will be replaced at a cost of about $17.6 million. A second closure to finish the work is scheduled for July. "These bridges were built in the late 50s and they're in very poor condition and nearing the end of their service life," said Bonnie Yu, MDOT's manager of the project to replace the two bridges. One portion of theI-94 upgrade will affect Metro Airport-bound motorists. Officials said they estimate traffic could back up as much as four miles during rush hour. MDOT also plans to make repairs to 12 bridges over I-94 between I-275 and Telegraph Road. The work, which will cost about $12 million, includes fixes to piers, railings and bridge decks. Two lanes of I-94 will be open in both directions weekdays and one lane will be open in off-peak hours. There will also only be one lane open on the I-94 Service Drive to the ramps for Merriman and Middle Belt roads. An $11.6 million replacement of the Brush Street bridge. The whole freeway will be closed during demolition and construction. The first closure is scheduled for April 12 and the second will be done sometime in the summer. Three railroad bridges over I-94 between the Lodge Freeway and Michigan Avenue. Part of the work includes repairing the eastbound ramp of I-94 to the northbound Lodge, the 24th Street bridge and the Warren bridge. The $9.4 million project will begin in May and end in late fall. Crews will also repair the Warren Avenue bridge over I-75, officials said. The project calls for replacing a beam, part of the deck and railing. The bridge was damaged last year when a semi-truck with a high load crashed into it. The cost of the repair is estimated to be about $300,000 and officials said the trucking company's insurance is paying for it. Resurfacing I-94 between Wyoming and Second Avenue. Work will be done mostly at night with two lane closures on four weekends in each direction. The $9.8 million project will start in May and end in late fall. Sign replacement between Michigan Avenue and Southfield Freeway. The $2.1 million project will begin in late April or early May. Concrete repairs on I-94 near Southfield Freeway. The $1.4 million project is scheduled to start in late April, depending on weather. "We have a strategy in place where most drivers will be able to use the freeway to get to work and to get home Monday through Friday on all three lanes in each direction," said MDOT spokesman Rob Morosi. "Weekends will be a bit more challenging. "It may seem like we're piling on, but we're not," he said. "We're strategically putting these projects in place so that by Thanksgiving, we have safer bridges, safer ramp movements and safer pavement." Officials said National Work Zone Awareness Week begins April 8. "Every time motorists drive through a work zone, they're driving by a father, a mother, a brother, a sister or a neighbor," said Davis Woo, work zone safety technical specialist. "That's their office, and we want drivers to think about that. That's why this year's slogan is: 'Drive like you work here.'" March 26, 2019, 4:43 p.m.